This page gives you a few hints for integrating the Vidinoti SDK in a Swift application. Retrieve your license key under “SDK” > “Licenses”. Copy it somewhere, you will need it later. Open the section “SDK” > “My Applications”. Create a new application with your application bundle ID. It is important that the registered bundle ID corresponds to your application otherwise the SDK won’t be able to connect to the backend. If you use several bundle ID (e.g. for staging), add each of them as a new application. 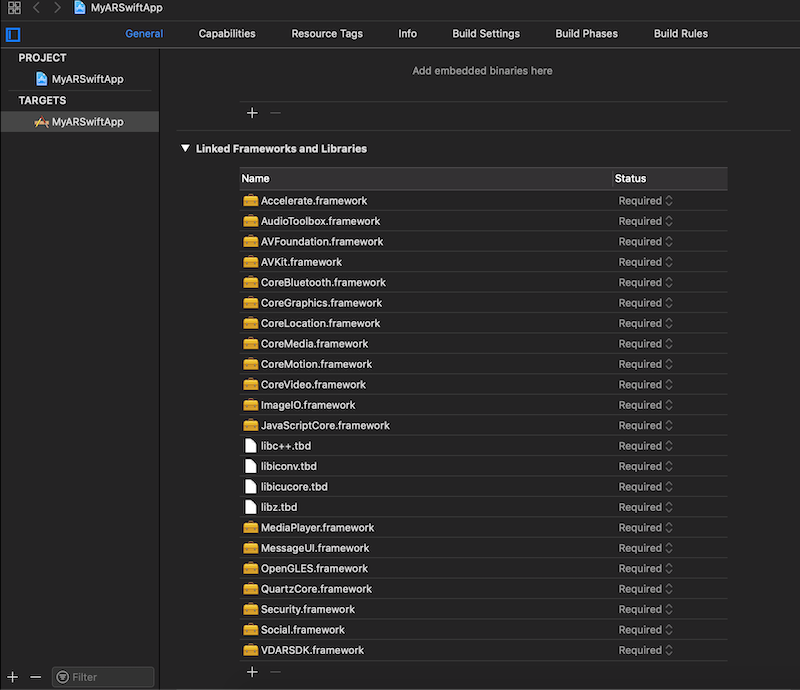 Copy VDARSDK.framework into your Xcode project. Open your project settings and select your app target in the “General” tab. Add VDARSDK.framework in the section “Linked Frameworks and Libraries”. We will now create a bridging header. Xcode can create one for you. Select “File” > “New” > “File…” and create a new Objective-C file (the filename is not important, we will delete it later). Xcode will ask you if you want to create a Bridging Header. Click “Create Bridging Header”. Delete the Objective-C file you have just created. You don’t need it anymore. It has just been used for creating the bridging header. Open the bridging header file. It is usually called <App name>-Bridging-Header.h and add the following line. Open your AppDelegate and add the following into the application(_:didFinishLaunchingWithOptions:) method. The synchronization should usually be done when the application starts. For example, it can be called from the method applicationDidBecomeActive of your AppDelegate. You must avoid doing several synchronization at the same time. If you don’t want to retrieve all the contents of your V-Director account, you can use tags for organizing your contents. You can then sychronize only with some tags like shown below. Multilingual contents also work with special tags. If you want to retrieve only the content of a given language, you must synchronize with the tag “lang_LanguageCode>”. For instance, if you want to synchronize with the contents in French, use the tag lang_fr. We will now add the AR scanner view. Modify your application such that your app contains a UIViewController that extends VDARLiveAnnotationViewController. The VDARLiveAnnotationViewController contains the camera view and handles the interaction with the AR contents. Show a progress indicator if the application is synchronizing. The image recognition does not work when the synchronization process is in progress. You will also need to add the key NSLocationAlwaysAndWhenInUseUsageDescription to your Info.plist file if your application may synchronize with GPS or beacon contents.